Painting is a lot of fun for all kids. It really brings out their creativity. The activities listed below are fun twist to traditional painting. Step 1: Have child pretend that the wax candle is a crayon and have them draw a picture using it on the watercolor paper. Step 2: After drawing the picture have child paint over the entire paper with watercolors. When the paint dries they will see their original drawing from the wax candle. This love this activity because they thinks it’s magic. Have fun! Step 2: Put each marble onto a paper plate. I like to use 3-6 marbles. Pour each color of your paint onto the marbles. Only a little is needed to cover each marble. Step 3: Using the plastic spoon pick up the marbles and place them inside the box. Make sure the marbles are on one side of the box over the paper. Close the box. Step 4: Have the kids shake the box. This is the fun part. Step 5: Pull out the paper and see what creation you have made. Step 4: Wait about 1/2 hour or until ice is half way frozen then take ice cube tray out of freeze. Place 1 craft/popsicle stick in each ice cube tray mold and put back into the freezer. Step 6: Once ice cubes are out hold them by the handle (craft/popsicle stick) and use like a paint brush on paper. Splatter painting is a lot of fun and easy for kids of all ages but beware this can be messy and is best done outside or if in the house make sure you cover the table with newspaper or table cloth. Kids can where smocks or and old shirt. Step 1: Place paper on a covered table. Step 3: Standing over their paper over the table have children tap the side of their paint brush or using their fingers flick the bottom of the paintbrush so the paint splatters all over their paper. See how many different patterns you can make with the splatter paint. Why use traditional paints when you can use salt! Try this activity to create fun art work. 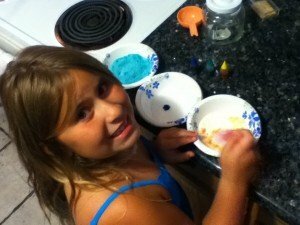 Step 2: Add 4 drops of food coloring to the salt and mix until all the sand is colored. Add more food coloring if needed. Repeat this step with each color you use. Step 3: Using a paint brush paint glue on desired area of picture that your child would like to be colored. Ok, so this can be messy but lots of fun. I recommend doing it out this outside or over a newspaper covered table. Step 1: Fill bottles with water to desired amount. Step 2: Add drops of food coloring until you are happy with your color. Step 3: Place paper over covered table or outside on the grass. Step 4: Have kids use spray bottles to design their art! Don’t spray too much. The paper will get too wet and will rip easy. It’s best to use a heavy weight paper for this project. If you have to create a poster for a school project try using spray art for the backgound. It works great on oak tag and looks very creative. This is a fun way to paint. Kids will get to see the different patterns each type of ball makes. Step 1: Place a piece of paper into the aluminum baking tin (try to use a piece of paper that covers the entire bottom of the tin). Step 2: Pour a little of each color paint onto the paper. Step 3: Add the balls and move tin from side to side. The balls will make different patterns all over the paper. If you use just the primary colors: blue, yellow, red. The colors will mix and forms new colors. This is a great exercise for teaching kids about how to form colors. Yellow and blue will make green, red and yellow make orange, yellow and blue make green and red and blue make purple.